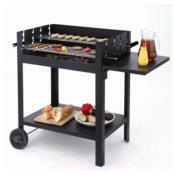 This barbecue is ideal for large BBQ parties but space is limited. The adjustable cooking heat of the individual grills help barbecuing for large gatherings and barbecues. Sturdy construction Complete with chrome plated grills that can be adjusted to 4 cooking heights. You can use one grill for cooking and the other grill can be used has a warming rack. Quick and easy assembly, no screws necessary. 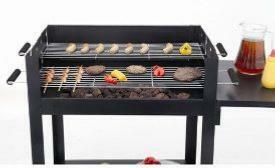 This compact Charcoal BBQ grill "Lambada” with stand is ideal if you don’t have much outdoor space. The Lambada BBQ Grill can cater for a big group of people. Four levels of height adjustment for the grill racks, allowing control over cooking temperatures. Holds up to 4kg charcoal. A shelf on one side of the grill is ideal for food preparation or storing utensils, whilst the full width shelf underneath provides loads of extra storage.